Excluding Mayotte, an overseas department of France. The Comoros (/ˈkɒməroʊz/ (listen); Arabic: جزر القمر‎, Juzur al-Qumur / Qamar), officially the Union of the Comoros (Comorian: Umoja wa Komori, French: Union des Comores, Arabic: الاتحاد القمري‎ al-Ittiḥād al-Qumurī / Qamarī), is an island country in the Indian Ocean located at the northern end of the Mozambique Channel off the eastern coast of Africa between northeastern Mozambique, the French region of Mayotte, and northwestern Madagascar. The capital and largest city in Comoros is Moroni. The religion of the majority of the population is Sunni Islam. At 1,660 km2 (640 sq mi), excluding the contested island of Mayotte, the Comoros is the fourth-smallest African nation by area. The population, excluding Mayotte, is estimated at 795,601. As a nation formed at a crossroads of different civilisations, the archipelago is noted for its diverse culture and history. The archipelago was first inhabited by Bantu speakers who came from East Africa, supplemented by Arab and Austronesian immigration. The sovereign state is an archipelago consisting of three major islands and numerous smaller islands, all in the volcanic Comoro Islands. The major islands are commonly known by their French names: northwestern-most Grande Comore (Ngazidja), Mohéli (Mwali), and Anjouan (Nzwani). In addition, the country has a claim on a fourth major island, southeastern-most Mayotte (Maore), though Mayotte voted against independence from France in 1974, has never been administered by an independent Comoros government, and continues to be administered by France (currently as an overseas department). France has vetoed United Nations Security Council resolutions that would affirm Comorian sovereignty over the island. In addition, Mayotte became an overseas department and a region of France in 2011 following a referendum passed overwhelmingly. It became part of the French colonial empire in the end of 19th century before becoming independent in 1975. Since declaring independence, the country has experienced more than 20 coups d'état or attempted coups, with various heads of state assassinated. Along with this constant political instability, the population of the Comoros lives with the worst income inequality of any nation, with a Gini coefficient over 60%, while also ranking in the worst quartile on the Human Development Index. As of 2008 about half the population lived below the international poverty line of US$1.25 a day. The French insular region of Mayotte, which is the more prosperous territory in the Mozambique Channel, is the major destination for Comorian illegal migrants who flee their country. The Comoros is a member state of the African Union, Francophonie, Organisation of Islamic Cooperation, Arab League (of which it is the southernmost state, being the only member state of the Arab League with a tropical climate and also entirely within the Southern Hemisphere) and the Indian Ocean Commission. Other countries near the Comoros are Tanzania to the northwest and the Seychelles to the northeast. Its capital is Moroni, on Grande Comore. The Union of the Comoros has three official languages—Comorian, Arabic, and French. The name "Comoros" derives from the Arabic word قمر qamar ("moon"). The first human inhabitants of the Comoro Islands are thought to have been Austronesian settlers travelling by boat from islands in Southeast Asia. These people arrived no later than the sixth century AD, the date of the earliest known archaeological site, found on Nzwani, although settlement beginning as early as the first century has been postulated. The islands of the Comoros were populated by a succession of peoples from the coast of Africa, the Arabian Peninsula and the Persian Gulf, the Malay Archipelago, and Madagascar. Bantu-speaking settlers reached the islands as a part of the greater Bantu expansion that took place in Africa throughout the first millennium. According to pre-Islamic mythology, a jinni (spirit) dropped a jewel, which formed a great circular inferno. This became the Karthala volcano, which created the island of Grande Comoro. Development of the Comoros is divided into phases. The earliest reliably recorded phase is the Dembeni phase (ninth to tenth centuries), during which each island maintained a single, central village. From the eleventh to the fifteenth centuries, trade with the island of Madagascar and merchants from the Middle East flourished, smaller villages emerged, and existing towns expanded. Many Comorians can trace their genealogies to ancestors from Yemen, mainly Hadhramaut, and Oman. According to legend, in 632, upon hearing of Islam, islanders are said to have dispatched an emissary, Mtswa-Mwindza, to Mecca—but by the time he arrived there, the Prophet Muhammad had died. Nonetheless, after a stay in Mecca, he returned to Ngazidja and led the gradual conversion of his islanders to Islam. Among the earliest accounts of East Africa, the works of Al-Masudi describe early Islamic trade routes, and how the coast and islands were frequently visited by Muslims including Persian and Arab merchants and sailors in search of coral, ambergris, ivory, tortoiseshell, gold and slaves. They also brought Islam to the people of the Zanj including the Comoros. As the importance of the Comoros grew along the East African coast, both small and large mosques were constructed. Despite its distance from the coast, the Comoros is situated along the Swahili Coast in East Africa. It was a major hub of trade and an important location in a network of trading towns that included Kilwa, in present-day Tanzania, Sofala (an outlet for Zimbabwean gold), in Mozambique, and Mombasa in Kenya. After the arrival of the Portuguese in the early 15th century and subsequent collapse of the East African sultanates, the powerful Omani Sultan Saif bin Sultan began to defeat the Dutch and the Portuguese. His successor Said bin Sultan increased Omani Arab influence in the region, moving his administration to nearby Zanzibar, which came under Omani rule. Nevertheless, the Comoros remained independent, and although the three smaller islands were usually politically unified, the largest island, Ngazidja, was divided into a number of autonomous kingdoms (ntsi). By the time Europeans showed interest in the Comoros, the islanders were well placed to take advantage of their needs, initially supplying ships of the route to India and, later, slaves to the plantation islands in the Mascarenes. Portuguese explorers first visited the archipelago in 1503. The islands provided provisions to the Portuguese fort at Mozambique throughout the 16th century. In 1793, Malagasy warriors from Madagascar first started raiding the islands for slaves. On the Comoros, it was estimated in 1865 that as much as 40% of the population consisted of slaves. France first established colonial rule in the Comoros in 1841. The first French colonists landed in Mayotte, and Andriantsoly (also known as Andrian Tsouli, the Sakalava Dia-Ntsoli, the Sakalava of Boina, and the Malagasy King of Mayotte) signed the Treaty of April 1841, which ceded the island to the French authorities. The Comoros served as a way station for merchants sailing to the Far East and India until the opening of the Suez Canal significantly reduced traffic passing through the Mozambique Channel. The native commodities exported by the Comoros were coconuts, cattle and tortoiseshell. French settlers, French-owned companies, and wealthy Arab merchants established a plantation-based economy that used about one-third of the land for export crops. After its annexation, France converted Mayotte into a sugar plantation colony. The other islands were soon transformed as well, and the major crops of ylang-ylang, vanilla, coffee, cocoa beans, and sisal were introduced. In 1886, Mohéli was placed under French protection by its Sultan Mardjani Abdou Cheikh. That same year, despite having no authority to do so, Sultan Said Ali of Bambao, one of the sultanates on Ngazidja, placed the island under French protection in exchange for French support of his claim to the entire island, which he retained until his abdication in 1910. In 1908 the islands were unified under a single administration (Colonie de Mayotte et dépendances) and placed under the authority of the French colonial governor general of Madagascar. In 1909, Sultan Said Muhamed of Anjouan abdicated in favour of French rule. In 1912 the colony and the protectorates were abolished and the islands became a province of the colony of Madagascar. Agreement was reached with France in 1973 for the Comoros to become independent in 1978. The deputies of Mayotte abstained. Referendums were held on all four of the islands. Three voted for independence by large margins, while Mayotte voted against, and remains under French administration. On 6 July 1975, however, the Comorian parliament passed a unilateral resolution declaring independence. Ahmed Abdallah proclaimed the independence of the Comorian State (État comorien; دولة القمر) and became its first president. The next 30 years were a period of political turmoil. On 3 August 1975, less than one month after independence, president Ahmed Abdallah was removed from office in an armed coup and replaced with United National Front of the Comoros (FNUK) member Prince Said Mohamed Jaffar. Months later, in January 1976, Jaffar was ousted in favour of his Minister of Defense Ali Soilih. At this time, the population of Mayotte voted against independence from France in two referenda. The first, held on 22 December 1974, won 63.8% support for maintaining ties with France, while the second, held in February 1976, confirmed that vote with an overwhelming 99.4%. The three remaining islands, ruled by President Soilih, instituted a number of socialist and isolationist policies that soon strained relations with France. On 13 May 1978, Bob Denard returned to overthrow President Soilih and reinstate Abdallah with the support of the French, Rhodesian and South African governments. During Soilih's brief rule, he faced seven additional coup attempts until he was finally forced from office and killed. In contrast to Soilih, Abdallah's presidency was marked by authoritarian rule and increased adherence to traditional Islam and the country was renamed the Federal Islamic Republic of the Comoros (République Fédérale Islamique des Comores; جمهورية القمر الإتحادية الإسلامية). Abdallah continued as president until 1989 when, fearing a probable coup d'état, he signed a decree ordering the Presidential Guard, led by Bob Denard, to disarm the armed forces. Shortly after the signing of the decree, Abdallah was allegedly shot dead in his office by a disgruntled military officer, though later sources claim an antitank missile was launched into his bedroom and killed him. Although Denard was also injured, it is suspected that Abdallah's killer was a soldier under his command. A few days later, Bob Denard was evacuated to South Africa by French paratroopers. Said Mohamed Djohar, Soilih's older half-brother, then became president, and served until September 1995, when Bob Denard returned and attempted another coup. This time France intervened with paratroopers and forced Denard to surrender. The French removed Djohar to Reunion, and the Paris-backed Mohamed Taki Abdoulkarim became president by election. He led the country from 1996, during a time of labour crises, government suppression, and secessionist conflicts, until his death November 1998. He was succeeded by Interim President Tadjidine Ben Said Massounde. The islands of Anjouan and Mohéli declared their independence from the Comoros in 1997, in an attempt to restore French rule. But France rejected their request, leading to bloody confrontations between federal troops and rebels. In April 1999, Colonel Azali Assoumani, Army Chief of Staff, seized power in a bloodless coup, overthrowing the Interim President Massounde, citing weak leadership in the face of the crisis. This was the Comoros' 18th coup, or attempted coup d'état since independence in 1975. Azali failed to consolidate power and reestablish control over the islands, which was the subject of international criticism. The African Union, under the auspices of President Thabo Mbeki of South Africa, imposed sanctions on Anjouan to help broker negotiations and effect reconciliation. The official name of the country was changed to the Union of the Comoros and a new system of political autonomy was instituted for each island, plus a union government for the three islands was added. Azali stepped down in 2002 to run in the democratic election of the President of the Comoros, which he won. Under ongoing international pressure, as a military ruler who had originally come to power by force, and was not always democratic while in office, Azali led the Comoros through constitutional changes that enabled new elections. A Loi des compétences law was passed in early 2005 that defines the responsibilities of each governmental body, and is in the process of implementation. The elections in 2006 were won by Ahmed Abdallah Mohamed Sambi, a Sunni Muslim cleric nicknamed the "Ayatollah" for his time spent studying Islam in Iran. Azali honoured the election results, thus allowing the first peaceful and democratic exchange of power for the archipelago. Colonel Mohammed Bacar, a French-trained former gendarme, seized power as President in Anjouan in 2001. He staged a vote in June 2007 to confirm his leadership that was rejected as illegal by the Comoros federal government and the African Union. On 25 March 2008 hundreds of soldiers from the African Union and the Comoros seized rebel-held Anjouan, generally welcomed by the population: there have been reports of hundreds, if not thousands, of people tortured during Bacar's tenure. Some rebels were killed and injured, but there are no official figures. At least 11 civilians were wounded. Some officials were imprisoned. Bacar fled in a speedboat to the French Indian Ocean territory of Mayotte to seek asylum. Anti-French protests followed in the Comoros (see 2008 invasion of Anjouan). Since independence from France, the Comoros experienced more than 20 coups or attempted coups. Following elections in late 2010, former Vice-President Ikililou Dhoinine was inaugurated as President on 26 May 2011. A member of the ruling party, Dhoinine was supported in the election by the incumbent President Ahmed Abdallah Mohamed Sambi. Dhoinine, a pharmacist by training, is the first President of the Comoros from the island of Mohéli. Following the 2016 elections, Azali Assoumani became president for a third term. The Comoros is formed by Ngazidja (Grande Comore), Mwali (Mohéli) and Nzwani (Anjouan), three major islands in the Comoros Archipelago, as well as many minor islets. The islands are officially known by their Comorian language names, though international sources still use their French names (given in parentheses above). The capital and largest city, Moroni, is located on Ngazidja. The archipelago is situated in the Indian Ocean, in the Mozambique Channel, between the African coast (nearest to Mozambique and Tanzania) and Madagascar, with no land borders. At 2,034 km2 (785 sq mi), it is one of the smallest countries in the world. The Comoros also has claim to 320 km2 (120 sq mi) of territorial seas. The interiors of the islands vary from steep mountains to low hills. Ngazidja is the largest of the Comoros Archipelago, approximately equal in area to the other islands combined. It is also the most recent island, and therefore has rocky soil. The island's two volcanoes, Karthala (active) and La Grille (dormant), and the lack of good harbours are distinctive characteristics of its terrain. 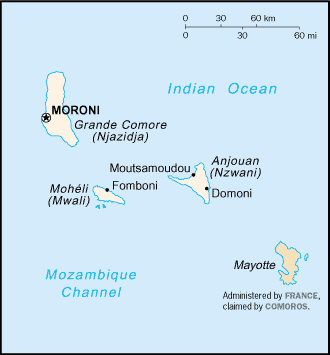 Mwali, with its capital at Fomboni, is the smallest of the four major islands. Nzwani, whose capital is Mutsamudu, has a distinctive triangular shape caused by three mountain chains – Sima, Nioumakélé and Jimilimé – emanating from a central peak, Mount N'Tingui (1,575 m or 5,167 ft). The islands of the Comoros Archipelago were formed by volcanic activity. Mount Karthala, an active shield volcano located on Ngazidja, is the country's highest point, at 2,361 metres (7,746 feet). It contains the Comoros' largest patch of disappearing rainforest. Karthala is currently one of the most active volcanoes in the world, with a minor eruption in May 2006, and prior eruptions as recently as April 2005 and 1991. In the 2005 eruption, which lasted from 17 to 19 April, 40,000 citizens were evacuated, and the crater lake in the volcano's 3 by 4 kilometres (1.9 by 2.5 miles) caldera was destroyed. The Comoros also lays claim to the Îles Éparses or Îles éparses de l'océan indien (Scattered Islands in the Indian Ocean) – Glorioso Islands, comprising Grande Glorieuse, Île du Lys, Wreck Rock, South Rock, Verte Rocks (three islets) and three unnamed islets – one of France's overseas districts. The Glorioso Islands were administered by the colonial Comoros before 1975, and are therefore sometimes considered part of the Comoros Archipelago. Banc du Geyser, a former island in the Comoros Archipelago, now submerged, is geographically located in the Îles Éparses, but was annexed by Madagascar in 1976 as an unclaimed territory. The Comoros and France each still view the Banc du Geyser as part of the Glorioso Islands and, thus, part of its particular exclusive economic zone. The climate is generally tropical and mild, and the two major seasons are distinguishable by their raininess. The temperature reaches an average of 29–30 °C (84–86 °F) in March, the hottest month in the rainy season (called kashkazi/kaskazi [meaning north monsoon], which runs from December to April), and an average low of 19 °C (66 °F) in the cool, dry season (kusi (meaning south monsoon), which proceeds from May to November). The islands are rarely subject to cyclones. The Comoros constitute an ecoregion in their own right, Comoros forests. In December 1952 a specimen of the Coelacanth fish was re-discovered off the Comoros coast. The 66 million year old species was thought to have been long extinct until its first recorded appearance in 1938 off the South African coast. Between 1938 and 1975, 84 specimens were caught and recorded. Politics of the Comoros takes place in a framework of a federal presidential republic, whereby the President of the Comoros is both head of state and head of government, and of a multi-party system. The Constitution of the Union of the Comoros was ratified by referendum on 23 December 2001, and the islands' constitutions and executives were elected in the following months. It had previously been considered a military dictatorship, and the transfer of power from Azali Assoumani to Ahmed Abdallah Mohamed Sambi in May 2006 was a watershed moment as it was the first peaceful transfer in Comorian history. Executive power is exercised by the government. Federal legislative power is vested in both the government and parliament. The preamble of the constitution guarantees an Islamic inspiration in governance, a commitment to human rights, and several specific enumerated rights, democracy, "a common destiny" for all Comorians. Each of the islands (according to Title II of the Constitution) has a great amount of autonomy in the Union, including having their own constitutions (or Fundamental Law), president, and Parliament. The presidency and Assembly of the Union are distinct from each of the islands' governments. The presidency of the Union rotates between the islands. Mohéli holds the current presidency rotation, and so Ikililou Dhoinine is President of the Union; Grand Comore and Anjouan follow in four-year terms. The Comorian legal system rests on Islamic law, an inherited French (Napoleonic Code) legal code, and customary law (mila na ntsi). Village elders, kadis or civilian courts settle most disputes. The judiciary is independent of the legislative and the executive. The Supreme Court acts as a Constitutional Council in resolving constitutional questions and supervising presidential elections. As High Court of Justice, the Supreme Court also arbitrates in cases where the government is accused of malpractice. The Supreme Court consists of two members selected by the president, two elected by the Federal Assembly, and one by the council of each island. Around 80 percent of the central government's annual budget is spent on the country's complex electoral system which provides for a semi-autonomous government and president for each of the three islands and a rotating presidency for the overarching Union government. A referendum took place on 16 May 2009 to decide whether to cut down the government's unwieldy political bureaucracy. 52.7% of those eligible voted, and 93.8% of votes were cast in approval of the referendum. The referendum would cause each island's president to become a governor and the ministers to become councillors. In November 1975, the Comoros became the 143rd member of the United Nations. The new nation was defined as comprising the entire archipelago, although the citizens of Mayotte chose to become French citizens and keep their island as a French territory. The Comoros has repeatedly pressed its claim to Mayotte before the United Nations General Assembly, which adopted a series of resolutions under the caption "Question of the Comorian Island of Mayotte", opining that Mayotte belongs to the Comoros under the principle that the territorial integrity of colonial territories should be preserved upon independence. As a practical matter, however, these resolutions have little effect and there is no foreseeable likelihood that Mayotte will become de facto part of the Comoros without its people's consent. More recently, the Assembly has maintained this item on its agenda but deferred it from year to year without taking action. Other bodies, including the Organization of African Unity, the Movement of Non-Aligned Countries and the Organisation of Islamic Cooperation, have similarly questioned French sovereignty over Mayotte. To close the debate and to avoid being integrated by force in the Union of the Comoros, the population of Mayotte overwhelmingly chose to become an overseas department and a region of France in a 2009 referendum. The new status was effective on 31 March 2011 and Mayotte has been recognised as an outermost region by European Union on 1 January 2014. This decision integrates Mayotte in the French Republic legally « one and indivisible ». The Comoros is a member of the African Union, the Arab League, the European Development Fund, the World Bank, the International Monetary Fund, the Indian Ocean Commission and the African Development Bank. On 10 April 2008, the Comoros became the 179th nation to accept the Kyoto Protocol to the United Nations Framework Convention on Climate Change. In May 2013 the Union of the Comoros became known for filing a referral to the Office of the Prosecutor of the International Criminal Court (ICC) regarding the events of "the 31 May 2010 Israeli raid on the Humanitarian Aid Flotilla bound for [the] Gaza Strip." In November 2014 the ICC Prosecutor eventually decided that the events did constitute war crimes but did not meet the gravity standards of bringing the case before ICC. The emigration rate of skilled workers was about 21.2% in 2000. The military resources of the Comoros consist of a small standing army and a 500-member police force, as well as a 500-member defence force. A defence treaty with France provides naval resources for protection of territorial waters, training of Comorian military personnel, and air surveillance. France maintains a few senior officers presence in the Comoros at government request. France maintains a small maritime base and a Foreign Legion Detachment (DLEM) on Mayotte. Once the new government was installed in May–June 2011, an expert mission from UNREC (Lomé) came to the Comoros and produced guidelines for the elaboration of a national security policy, which were discussed by different actors, notably the national defence authorities and civil society. By the end of the programme in end March 2012, a normative framework agreed upon by all entities involved in SSR will have been established. This will then have to be adopted by Parliament and implemented by the authorities. The Comoros is one of the world's poorest countries. Economic growth and poverty reduction are major priorities for the government. With a rate of 14.3%, unemployment is considered very high. Agriculture, including fishing, hunting, and forestry, is the leading sector of the economy, and 38.4% of the working population is employed in the primary sector. High population densities, as much as 1000 per square kilometre in the densest agricultural zones, for what is still a mostly rural, agricultural economy may lead to an environmental crisis in the near future, especially considering the high rate of population growth. In 2004 the Comoros' real GDP growth was a low 1.9% and real GDP per capita continued to decline. These declines are explained by factors including declining investment, drops in consumption, rising inflation, and an increase in trade imbalance due in part to lowered cash crop prices, especially vanilla. Fiscal policy is constrained by erratic fiscal revenues, a bloated civil service wage bill, and an external debt that is far above the HIPC threshold. Membership in the franc zone, the main anchor of stability, has nevertheless helped contain pressures on domestic prices. The Comoros has an inadequate transportation system, a young and rapidly increasing population, and few natural resources. The low educational level of the labour force contributes to a subsistence level of economic activity, high unemployment, and a heavy dependence on foreign grants and technical assistance. Agriculture contributes 40% to GDP, employs 80% of the labour force, and provides most of the exports. The Comoros is the world's largest producer of ylang-ylang, and a large producer of vanilla. The government is struggling to upgrade education and technical training, to privatise commercial and industrial enterprises, to improve health services, to diversify exports, to promote tourism, and to reduce the high population growth rate. The Comoros is a member of the Organization for the Harmonization of Business Law in Africa (OHADA). With fewer than a million people, the Comoros is one of the least populous countries in the world, but is also one of the most densely populated, with an average of 275 inhabitants per square kilometre (710/sq mi). In 2001, 34% of the population was considered urban, but that is expected to grow, since rural population growth is negative, while overall population growth is still relatively high. Almost half the population of the Comoros is under the age of 15. Major urban centres include Moroni, Mutsamudu, Domoni, Fomboni, and Tsémbéhou. There are between 200,000 and 350,000 Comorians in France. The islands of the Comoros share mostly African-Arab origins. One of the largest ethnic groups on the various islands of Comoros remain the Shirazi people. Minorities include Malagasy (Christian) and Indian (mostly Ismaili), as well as other minorities mostly descended from early French settlers. Chinese people are also present in parts of Grande Comore (especially Moroni). A small white minority of French with other European (i.e. Dutch, British and Portuguese) ancestry lives in the Comoros. Most French left after independence in 1975. The most common language in the Comoros is Comorian, or Shikomori. It is a language related to Swahili, with four different variants (Shingazidja, Shimwali, Shinzwani and Shimaore) being spoken on each of the four islands. Arabic and Latin scripts are both used, Arabic being the more widely used, and an official orthography has recently been developed for the Latin script. Arabic and French are also official languages, along with Comorian. Arabic is widely known as a second language, being the language of Quranic teaching. French is the administrative language and the language of all non-Quranic formal education. Sunni Islam is the dominant religion, representing as much as 99% of the population. A minority of the population of the Comoros, mostly immigrants from metropolitan France, are Roman Catholic. Comoros is the only Muslim-majority country in Southern Africa and the second southernmost Muslim-majority territory after the French territory of Mayotte. There are 15 physicians per 100,000 people. The fertility rate was 4.7 per adult woman in 2004. Life expectancy at birth is 67 for females and 62 for males. Almost all of the educated populace of the Comoros have attended Quranic schools at some point in their lives, often before regular schooling. Here, boys and girls are taught about the Qur'an, and memorise it. Some parents specifically choose this early schooling to offset French schools children usually attend later. Since independence and the ejection of French teachers, the education system has been plagued by poor teacher training and poor results, though recent stability may allow for substantial improvements. Pre-colonization education systems in Comoros focused on necessary skills such as agriculture, caring for livestock and completing household tasks. Religious education also taught children the virtues of Islam. The education system underwent a transformation during colonization in the early 1900s which brought secular education based on the French system. This was mainly for children of the elite. After Comoros gained independence in 1975, the education system changed again. Funding for teachers' salaries was lost, and many went on strike. Thus, the public education system was not functioning between 1997 and 2001. Since gaining independence, the education system has also undergone a democratization and options exist for those other than the elite. Enrollment has also grown. In 2000, 44.2% of children ages 5 to 14 years were attending school. There is a general lack of facilities, equipment, qualified teachers, textbooks and other resources. Salaries for teachers are often so far in arrears that many refuse to work. Prior to 2000, students seeking a university education had to attend school outside of the country, however in the early 2000s a university was created in the country. This served to help economic growth and to fight the "flight" of many educated people who were not returning to the islands to work. About fifty-seven percent of the population is literate in the Latin script while more than 90% are literate in the Arabic script; total literacy is estimated at 77.8%. Comorian has no native script, but both Arabic and Latin scripts are used. Traditional Comorian women wear colourful sari-like dresses called shiromani, and apply a paste of ground sandalwood and coral called msinzano to their faces. Traditional male clothing is a colourful long skirt and a long white shirt. There are two types of marriages in Comoros, the Mna dabo (little marriage) and the ada (grand marriage). The little marriage is a simple legal marriage. It is small, intimate, and inexpensive. The bride's dowry is nominal. The little marriage, however, is just a placeholder until the couple can afford the ada, or grand marriage. The hallmarks of the grand marriage are dazzling gold jewelry, two weeks of celebration and an enormous bridal dowry. The groom must pay most of the expenses for this event, and the bride's family typically pays only a third of that of the groom's. The grand wedding can cost up to £55,000. Many men cannot afford this until their late 40's, if ever. The grand marriage is a symbol of social status on the Comoros islands. The completion of an ada marriage also greatly increases a man's standing in the Comoran hierarchy. A Comoran man can only wear certain elements of the national dress or stand in the first line at the mosque if he has had a grand marriage. Also, one is not fully considered a man until he has had an ada marriage. Comorian society has a bilateral descent system. Lineage membership and inheritance of immovable goods (land, housing) is matrilineal, passed in the maternal line, similar to many Bantu peoples who are also matrilineal, while other goods and patronymics are passed in the male line. However, there are differences between the islands, the matrilineal element being stronger on Ngazidja. Zanzibar's taarab music remains the most influential genre on the islands. There is a government-owned national newspaper in Comoros, Al-Watwan, published in Moroni. Radio Comoros is the national radio service and Comoros National TV is the television service. This article incorporates text from the Library of Congress Country Studies, which is in the public domain. ^ a b c d "Comoros". International Monetary Fund. Retrieved 17 April 2012. ^ "GINI index". World Bank. Archived from the original on 30 April 2014. Retrieved 26 July 2013. ^ "2016 Human Development Report" (PDF). United Nations Development Programme. 2016. Archived (PDF) from the original on 25 August 2017. Retrieved 21 March 2017. ^ a b The first UN General Assembly Resolution regarding the matter, "Question of the Comorian island of Mayotte (PDF)", United Nations General Assembly Resolution A/RES/31/4, (21 October 1976) states "the occupation by France of the Comorian island of Mayotte constitutes a flagrant encroachment on the national unity of the Comorian State, a Member of the United Nations," rejecting the French-administered referendums and condemning French presence in Mayotte. ^ As defined by the Organization of African Unity, the Movement of Non-Aligned Countries, the Organisation of Islamic Cooperation, and the United Nations General Assembly: the most recent UN General Assembly Resolution regarding the matter, "Question of the Comorian island of Mayotte," United Nations General Assembly Resolution A/RES/49/18, (6 December 1994) states "the results of the referendum of 22 December 1974 were to be considered on a global basis and not island by island,...Reaffirms the sovereignty of the Islamic Federal Republic of the Comoros over the island of Mayotte". Several resolutions expressing similar sentiments were passed between 1977 (31/4) and 1994 (49/18). ^ "Subjects of UN Security Council Vetoes". Global Policy Forum. Archived from the original on 17 March 2008. Retrieved 27 March 2008. ^ "Article 33, Repertory, Supplement 5, vol. II (1970–1978)" (PDF). United Nations, Office of Legal Affairs (OLA). Archived from the original (PDF) on 6 October 2014. ^ a b "Anti-French protests in Comoros". BBC News. 27 March 2008. Archived from the original on 28 March 2008. Retrieved 27 March 2008. ^ "Intrigue in the world's most coup-prone island paradise". economist.com. The Economist. Archived from the original on 25 January 2019. Retrieved 25 January 2019. ^ "The Islands of the Moon". Aramco World. 47 (4): 40. July – August 1996. Archived from the original on 13 October 2007. Retrieved 20 September 2007. ^ Federal Research Division of the Library of Congress under the Country Studies/Area Handbook Program (August 1994). Ralph K. Benesch (ed.). A Country Study: Comoros. Washington, D.C.: US Department of the Army. Archived from the original on 12 January 2007. Retrieved 15 January 2007. ^ a b Thomas Spear (2000). "Early Swahili History Reconsidered". The International Journal of African Historical Studies. 33 (2): 257–290. doi:10.2307/220649. JSTOR 220649. ^ Pierre Vérin (1982). "Mtswa Muyindza et l'introduction de l'Islam à Ngazidja; au sujet de la tradition et du texte de Pechmarty". Etudes Océan Indien. 2: 95–100. ^ a b Thomas Spear (1984). "The Shirazi in Swahili Traditions, Culture, and History". History in Africa. African Studies Association. 11: 291–305. doi:10.2307/3171638. JSTOR 3171638. ^ "French acquisition of Comoros" (PDF). Encyclopedia of Islam 1979, vol. v, p. 381. Archived (PDF) from the original on 8 December 2015. Retrieved 18 November 2015. ^ Barbara Dubins (September 1969). "The Comoro Islands: A Bibliographical Essay". African Studies Bulletin. African Studies Association. 12 (2): 131–137. doi:10.2307/523155. JSTOR 523155. ^ André Bourde (May 1965). "The Comoro Islands: Problems of a Microcosm". The Journal of Modern African Studies. 3 (1): 91–102. doi:10.1017/S0022278X00004924. ^ a b Eliphas G. Mukonoweshuro (October 1990). "The Politics of Squalor and Dependency: Chronic Political Instability and Economic Collapse in the Comoro Islands". African Affairs. 89 (357): 555–577. JSTOR 722174. ^ a b Abdourahim Said Bakar (1988). "Small Island Systems: A Case Study of the Comoro Islands". Comparative Education. 24 (2, Special Number (11): Education and Minority Groups): 181–191. doi:10.1080/0305006880240203. ^ Christopher S. Wren (8 December 1989). "Mercenary Holding Island Nation Seeks Deal". New York Times. Archived from the original on 20 March 2017. Retrieved 6 February 2017. ^ Judith Matloff (6 October 1995). "Mercenaries seek fun and profit in Africa". 87 (219). Christian Science Monitor. ISSN 0882-7729. Archived from the original on 24 October 2014. Retrieved 24 October 2014. ^ Marlise Simons (5 October 1995). "1,000 French Troops Invade Comoros to Put Down Coup". New York Times. Section A; Page 10; Column 3. Archived from the original on 22 July 2016. Retrieved 6 February 2017. ^ "French Mercenary Gives Up in Comoros Coup". New York Times. Associated Press. 6 October 1995. Section A; Page 7; Column 1. Archived from the original on 22 July 2016. Retrieved 6 February 2017. ^ Kamal Eddine Saindou (6 November 1998). "Comoros president dies from heart attack". Associated Press. pp. International News. Archived from the original on 28 March 2015. ^ Moyiga Nduru (17 September 1997). "COMORO ISLANDS: Tension Rising in the Indian Ocean Archipelago". IPS-Inter Press Service/Global Information Network. Archived from the original on 24 October 2014. Retrieved 24 October 2014. ^ "COMOROS: COUP LEADER GIVES REASONS FOR COUP". BBC Monitoring Africa (Radio France Internationale). 1 May 1999. ^ Rodrique Ngowi (3 August 2000). "Breakaway island's ruler says no civilian rule until secession crisis resolved". Associated Press. ^ "Mbeki flies in to Comoros islands summit in bid to resolve political crisis". Agence France Presse. 20 December 2003. ^ "Comoros said "calm" after Azali Assoumani declared elected as federal president". BBC Monitoring Africa. 10 May 2002. ^ UN Integrated Regional Information Networks (15 May 2006). "Comoros; Ahmed Abdallah Sambi Set to Win Presidency by a Landslide". AllAfrica, Inc. Africa News. ^ "COMOROS: The legacy of a Big Man on a small island". IRIN. Archived from the original on 20 December 2008. Retrieved 25 March 2009. ^ "Prehistoric fish offers rare glimpse of hidden sea life – Coelacanth (1953)". Abilene Reporter-News. 23 February 1953. p. 25. Archived from the original on 1 April 2019. Retrieved 18 June 2017. ^ "70-million-year-old fish dissected – Coaelacanth (1975)". Redlands Daily Facts. 28 May 1975. p. 6. Archived from the original on 1 April 2019. Retrieved 18 June 2017. ^ "Comoros 2001 (rev. 2009)". Constitute. Archived from the original on 6 September 2015. Retrieved 23 April 2015. ^ a b "FUNDAMENTAL LAW OF THE UNION OF COMOROS (English excerpts)". Centre for Human Rights, University of Pretoria, South Africa. Archived from the original (Word document) on 9 October 2006. ^ AFRICAN ELECTIONS DATABASE Archived 9 July 2011 at the Wayback Machine, Elections in the Comoros. ^ "COMOROS: Reforming 'the coup-coup islands'". IRIN. Archived from the original on 30 September 2009. Retrieved 25 March 2009. ^ "Comoros: Referendum Approves Downscaling of Government". AllAfrica Global Media. 19 May 2009. Archived from the original on 25 May 2009. Retrieved 20 May 2009. ^ "Forty-ninth session: Agenda item 36: 49/18. Question of the Comorian island of Mayotte" (PDF). United Nations General Assembly. 6 December 1994. Archived from the original (PDF) on 27 May 2008. ^ "unfccc.int KYOTO PROTOCOL – STATUS OF RATIFICATION" (PDF). Unfccc.int. Archived (PDF) from the original on 23 June 2013. Retrieved 25 August 2017. ^ Ratha, Dilip; Sanket Mohapatra; Ani Silwal (2011). "The Migration and Remittances Factbook 2011: Comoros" (PDF). Worldbank.org. Archived (PDF) from the original on 4 March 2016. Retrieved 29 November 2016. ^ a b Office of the General Commissioner for Planning, Ministry of Planning and Regional Development (October 2005). "UNION OF THE COMOROS: POVERTY REDUCTION AND GROWTH STRATEGY PAPER (UPDATED INTERIM PAPER)" (PDF). Archived (PDF) from the original on 31 December 2006. ^ "Comoros: Financial Sector Profile". mfw4a.org. Archived from the original on 13 May 2011. Retrieved 15 January 2011. ^ "Rural Poverty Portal". ruralpovertyportal.org. Archived from the original on 18 January 2017. Retrieved 7 October 2016. ^ Population Division of the Department of Economic and Social Affairs of the United Nations Secretariat (2005) World Population Prospects: The 2004 Revision and World Urbanization Prospects: The 2005 Revision Archived 23 June 2017 at the Wayback Machine. ^ "Comoros Archived 26 June 2009 at the Wayback Machine". Encyclopædia Britannica. ^ "FACTBOX-Relations between France and Comoros Archived 12 October 2017 at the Wayback Machine". Reuters. 27 March 2008. ^ Mohamed Ahmed-Chamanga (2010). Introduction à la grammaire structurale du comorien. Moroni: Komedit. ^ "The World Factbook — Central Intelligence Agency". cia.gov. Archived from the original on 6 April 2011. Retrieved 15 May 2007. ^ "CIA World Factbook: Comoros". Cia.gov. Archived from the original on 6 April 2011. Retrieved 15 January 2011. ^ "WHO Country Offices in the WHO African Region – WHO Regional Office for Africa" (PDF). Afro.who.int. Archived from the original (PDF) on 7 January 2010. Retrieved 1 June 2010. ^ "Comoros". 2005 Findings on the Worst Forms of Child Labor Archived 9 January 2014 at the Wayback Machine. Bureau of International Labor Affairs, U.S. Department of Labor (2006). This article incorporates text from this source, which is in the public domain. ^ "Université des Comores". Univ-comores.km. Archived from the original on 3 May 2017. Retrieved 12 May 2017. ^ UNESCO Institute for Statistics, country profile of Comoros; 2004 Archived 31 December 2006 at the Wayback Machine. ^ "Union of Comoros". Arab Cultural Trust. Archived from the original on 27 December 2016. Retrieved 29 November 2016. ^ "Comoros Islands: Islands & Beyond". comoros-islands.com. Archived from the original on 15 November 2016. Retrieved 29 November 2016. ^ "Accueil – Al-watwan, Quotidien comorien". Alwatwan.net. Archived from the original on 26 August 2017. Retrieved 25 August 2017. Martin Ottenheimer and Harriet Ottenheimer (1994). Historical Dictionary of the Comoro Islands. African Historical Dictionaries; No. 59. Metuchen, N.J.: Scarecrow Press. ISBN 978-0-585-07021-6. Anjouan (also known as Ndzuwani or Nzwani, and historically as Johanna or Hinzuan) is an autonomous high island in the Indian Ocean that forms part of the Union of the Comoros. Its chief town is Mutsamudu and, as of 2006, its population is around 277,500. The total area of the island is 424 square kilometers (163 square miles). The unicameral Assembly of the Union of the Comoros is the country's legislative body. It was established in 2004, and its predecessor was the Federal Assembly. The Comoro Islands or Comoros (Shikomori Komori; Arabic: جزر القمر‎, Juzur al-Qomor; French Les Comores) form an archipelago of volcanic islands situated off the south-east coast of Africa, to the east of Mozambique and north-west of Madagascar. The islet of Banc du Geyser and the Glorioso Islands are part of the archipelago. The islands are politically divided between Union of the Comoros (pop. 850,688) and two territories of France: the department of Mayotte (pop. 270,372) and the Glorioso Islands, a part of the Scattered Islands in the Indian Ocean, the 5th district of the French Southern and Antarctic Lands. Comoros first participated at the Olympic Games in 1996, and has sent athletes to compete in every Summer Olympic Games since then. The nation has never participated in the Winter Olympic Games. As of 2016, no athlete from Comoros has ever won an Olympic medal. The National Olympic Committee for Comoros was created in 1979 and recognized by the International Olympic Committee in 1993. The Comoros national football team is the national football team of Comoros, which is controlled by the Comoros Football Federation. It was formed in 1979, joined the Confederation of African Football (CAF) in 2003, and became a FIFA member in 2005. Comoros–United States relations are the international relations between the Comoros and the United States; the relations are friendly. The United States recognized the Comorian Government in 1977. The Comorians inhabiting Grande Comore, Anjouan, and Mohéli (86% of the population) share African-Arab origins. Islam is the dominant religion, and Quranic schools for children reinforce its influence. Although Islamic culture is firmly established throughout, a small minority are Christian. The most common language is Comorian, related to Swahili. French and Arabic also are spoken. About 89% of the population is literate. 2003-09-15: 575,660Population density figures conceal a great disparity between the republic's most crowded island, Nzwani, which had a density of 470 persons per square kilometer in 1991; Ngazidja, which had a density of 250 persons per square kilometer in 1991; and Mwali, where the 1991 population density figure was 120 persons per square kilometer. Overall population density increased to about 285 persons per square kilometer by 1994. By comparison, estimates of the population density per square kilometer of the Indian Ocean's other island microstates ranged from 241 (Seychelles) to 690 (Maldives) in 1993. Given the rugged terrain of Ngazidja and Nzwani, and the dedication of extensive tracts to agriculture on all three islands, population pressures on the Comoros are becoming increasingly critical. The age structure of the population of the Comoros is similar to that of many developing countries, in that the republic has a very large proportion of young people. In 1989, 46.4 percent of the population was under fifteen years of age, an above-average proportion even for sub-Saharan Africa. The population's rate of growth was a relatively high 3.5 percent per annum in the mid 1980s, up substantially from 2.0 percent in the mid-1970s and 2.1 percent in the mid-1960s. In 1983 the Abdallah regime borrowed US$2.85 million from the International Development Association to devise a national family planning program. However, Islamic reservations about contraception made forthright advocacy and implementation of birth control programs politically hazardous, and consequently little was done in the way of public policy. The Comorian population has become increasingly urbanized in recent years. In 1991 the percentage of Comorians residing in cities and towns of more than 5,000 persons was about 30 percent, up from 25 percent in 1985 and 23 percent in 1980. The Comoros' largest cities were the capital, Moroni, with about 30,000 people, and the port city of Mutsamudu, on the island of Nzwani, with about 20,000 people. Migration among the various islands is important. Natives of Nzwani have settled in significant numbers on less crowded Mwali, causing some social tensions, and many Nzwani also migrate to Maore. In 1977 Maore expelled peasants from Ngazidja and Nzwani who had recently settled in large numbers on the island. Some were allowed to reenter starting in 1981 but solely as migrant labor. The number of Comorians living abroad has been estimated at between 80,000 and 100,000; during the colonial period, most of them lived in Tanzania, Madagascar, and other parts of Southeast Africa. The number of Comorians residing in Madagascar was drastically reduced after anti-Comorian rioting in December 1976 in Mahajanga, in which at least 1,400 Comorians were killed. As many as 17,000 Comorians left Madagascar to seek refuge in their native land in 1977 alone. About 100,000 Comorians live in France; many of them had gone there for a university education and never returned. Small numbers of Indians, Malagasy, South Africans, and Europeans (mostly French) live on the islands and play an important role in the economy. Most French left after independence in 1975. Some Persian Gulf countries started buying Comorian citizenship for their stateless bidoon residents and deporting them to Comoros. Grande Comore (Swahili: Ngazidja) is an island in the Indian Ocean off the coast of Africa. It is the largest island in the Comoros nation. Most of its population is of the Comorian ethnic group. Its population as of 2006 is about 316,600. The island's capital is Moroni, which is also the national capital. The island is made up of two shield volcanoes, with Mount Karthala being the country's highest point at 2,361 m (7,746 ft) above sea level. According to the 2009 revision of the constitution of 2002, it is governed by an elected Governor, as are the other islands, with the federal government being much reduced in power. The name Ngazidja is sometimes seen in the now nonstandard form Njazidja. The history of the Comoros goes back some 1,500 years. The Comoros have been inhabited by various groups throughout this time. France colonised the islands in the 19th century, and they became independent in 1975. This is a list of airlines currently operating in the Comoros. The following is a list of heads of state of the Comoros, since the country gained independence from France in 1975. The island was populated from neighbouring East Africa with later arrival of Arabs, who brought Islam. A sultanate was established in 1500. In the 19th century, Mayotte was conquered by Andriantsoly, former king of Iboina on Madagascar, and later by the neighbouring islands Mohéli and then Anjouan before being purchased by France in 1841. The people of Mayotte voted to remain politically a part of France in the 1974 referendum on the independence of the Comoros. Mayotte became an overseas department on 31 March 2011 and became an outermost region of the European Union on 1 January 2014, following a 2009 referendum with an overwhelming result in favour of the department status. The Comorian Armed Forces (French Armée nationale de développement) consist of a small standing army and a 500-member police force, as well as a 500-member defense force. A defense treaty with France provides naval resources for protection of territorial waters, training of Comorian military personnel, and air surveillance. France maintains a small troop presence in the Comoros at government request. France maintains a small maritime base and a Foreign Legion Detachment (DLEM) on Mayotte. The Military ranks of Comoros are the military insignia used by the Military of Comoros. Being a former colony of France, Comoros shares a rank structure similar to that of France. France also provides protection of territorial waters and air surveillance, as Comoros has neither a navy nor an air force. Moroni (Arabic: موروني Mūrūnī) is the largest city, federal capital and seat of the government of the Union of the Comoros, a sovereign archipelago nation in the Indian Ocean. Moroni means "at the river" (mroni in Shingazidja). Moroni is the capital of the semi-autonomous island of Ngazidja, the largest of the three main islands of the republic. The city's estimated population in 2003 was 41,557 residents. Moroni, which lies along the Route Nationale 1, has a port and several mosques such as the Badjanani Mosque. The Comoros is a group of islands in the Indian Ocean, mostly an independent nation but also including the French territory of Mayotte. It is historically linked to both East Africa and France, and now has a strong Malagasy influence. Zanzibar's taarab music, however, remains the most influential genre on the islands, and a Comorian version called twarab is popular. Leading twarab bands include Sambeco and Belle Lumière, as well as singers including Chamsia Sagaf and Mohammed Hassan. Free for transit visitors with a stay for a maximum of 24 hoursAll visitors must hold a passport valid for 6 months and return or onward tickets. Among men who can afford it, the preferred form of marriage appears to be polygyny with matrilocal residence. Although possible, the first marriage is formally initiated with the grand marriage when possible, subsequent unions involve much simpler ceremonies. The result is that a man will establish two or even more households and will alternate residence between them, a reflection, most likely, of the trading origins of the Shirazi elite who maintained wives at different trading posts. Said Mohamed Djohar, elected president in 1990, had two wives, one in Njazidja and the other in Nzwani, an arrangement said to have broadened his appeal to voters. For men, divorce is easy, although by custom a divorced wife retains the family home. In the Comoros certain landholdings called magnahouli are controlled by women and inherited through the female line, apparently in observance of a surviving matriarchal African tradition. Despite their lower economic status, women in the Comoros who are married to farmers or laborers often move about more freely than their counterparts among the social elite, managing market stands or working in the fields. On Mwali, where traditional Islamic values are less dominant, women generally are not as strictly secluded. Women constituted 40.4 percent of the work force in 1990, a figure slightly above average for sub-Saharan Africa. Girls are somewhat less likely than boys to attend school in the Comoros. The World Bank estimated in 2010 that 70.6 percent of girls were enrolled in primary schools, whereas 80.5 percent of boys were enrolled. In secondary school, 15 percent of eligible Comoran girls were in attendance, in comparison with about 19 percent of eligible boys. Although the 1992 constitution recognizes their right to suffrage, as did the 1978 constitution, women otherwise play a limited role in politics in the Comoros. By contrast, in Mahoré female merchants sparked the movement for continued association with France, and later, for continued separation from the Republic of the Comoros. The Comoros accepted international aid for family planning in 1983, but it was considered politically inexpedient to put any plans into effect. According to a 1993 estimate, there were 6.8 births per woman in the Comoros. By contrast, the figure was 6.4 births per woman for the rest of sub-Saharan Africa. In one of Comoran society's first acknowledgments of women as a discrete interest group, the Abdallah government organized a seminar, "Women, Family, and Development," in 1986. Despite participants' hopes that programs for family planning and female literacy would be announced, conference organizers stressed the role of women in agriculture and family life. Women fared slightly better under the Djohar regime. In February 1990, while still interim president, Djohar created a cabinet-level Ministry of Social and Women's Affairs, and appointed a woman, Ahlonkoba Aithnard, to head it. She lasted until a few weeks after Djohar's election to the presidency in March, when her ministry was reorganized out of existence, along with several others. Another female official, Situ Mohamed, was named to head the second-tier Ministry of Population and Women's Affairs, in August 1991. She lost her position—and the subministry was eliminated—hardly a week later, in one of President Djohar's routine ministerial reshufflings. Djohar made another nod to women in February 1992, when he invited representatives of an interest group, the Women's Federation, to take part in discussions on what would become the constitution of 1992. Women only apparently organized and participated in a large demonstration critical of French support of the Djohar regime in October 1992, following government suppression of a coup attempt.